Liberate Tate is an art collective that has conducted unsolicited performances in the UK’s Tate galleries since 2010 to encourage the Tate to end its relationship with the controversial BP oil company. To achieve this aim, the group makes use of both activist strategies and artistic competence. Liberate Tate imagines postartistic times as an age of disinvestment, when oil companies would hold no place in artistic institutions (see: museum 3.0). In the United Kingdom and elsewhere, the fossil fuel companies use museums to “artwash” their reputations while conducting neo-colonial and ecocidal activities. 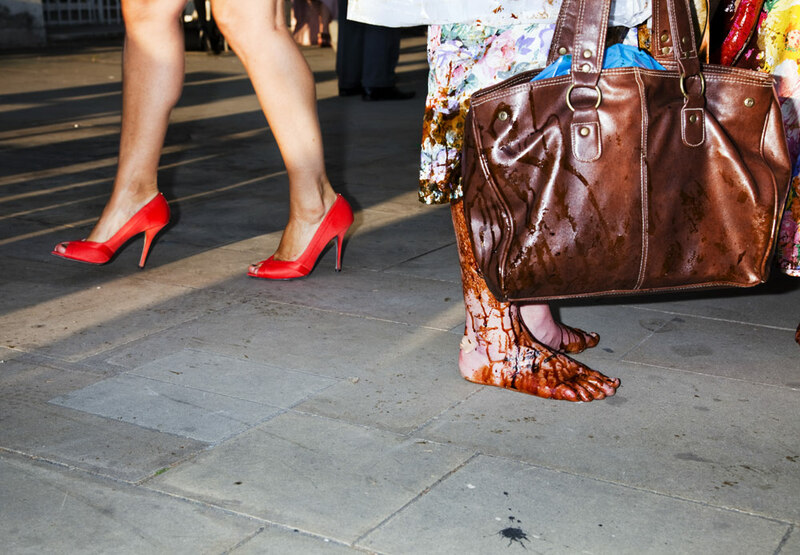 The chair of Tate’s trustees, who decide on sponsorship, is ex-BP CEO Lord John Browne. 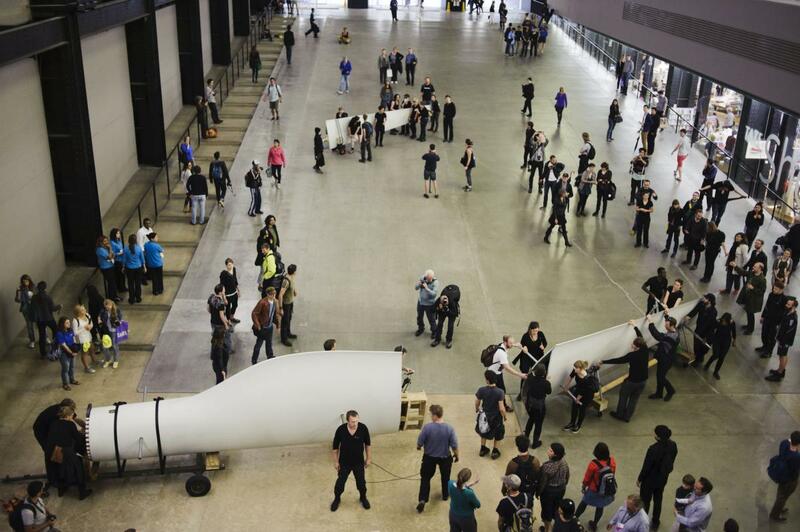 In the performance documented here, Liberate Tate brought a 1.5 ton, 16.5 meter wind turbine blade into Tate Modern’s Turbine Hall gallery. It was left there as a “gift” to the nation of Britain, with legal paperwork which forced the museum to hold on to the object while considering whether to keep it as a donation to its permanent art collection. On display is not an original turbine but rather one solicited in Poland in order to materially substantiate this action and serve as a report. Liberate Tate has conducted 18 performances to date: spilling oil in the Tate Modern during BP’s Gulf of Mexico oil spill; bringing melting ice from the arctic into the galleries; occupying the museum overnight while writing on its floor scientific and other texts on climate change; livestreaming BP’s court trial into the museum following the Gulf of Mexico oil spill; and setting up a live tattooing studio in the museum. Following legal action, Tate were forced to reveal in court that their sponsorship from BP contributes less than 0.5% of the museum’s annual budget. The report presented in exhibition consists of the film work The Gift and a portion of a wind turbine measuring three meters in length and loaned to the Museum of Modern Art in Warsaw for the duration of exhibition. Film courtesy Liberate Tate. Turbine courtesy the Swind company, Zakrzew.